Off campus, communication arts major Amanda Moreno is a part-time table-turning Disc Jockey. Amanda recalled: “DJ Kool conducted when the beat stopped, when it started, he cued both Biz Markie and Doug E. Fresh while simultaneously providing ad-libs and crowd control. 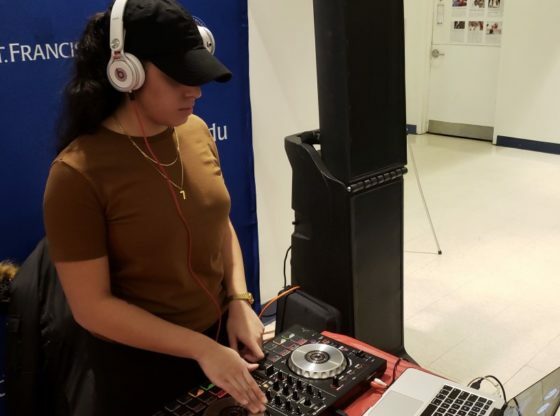 Aside from other artists, Moreno learned on her own and paid for beginner classes at Scratch Academy – a whole school dedicated to DJing. In the school, she was placed in small classes and learned hands-on interactive DJ skills. Although she said that the classes were hard and weird, she graduated and got her first Pioneer DJ equipment. “I bought a controller — which are basically turntables digitalized that work with your laptop — one of the cheapest I could find,” Moreno said. As a part-time DJ, she enjoys summer and weekend gigs for bars, lounges, restaurants or anyplace that just wants a little more action. For Moreno, there is a definite rush whenever the crowd gets going. Despite playing current artists, she mentioned that legendary DJs like Grandmaster Flash still hold a place in her heart. Even though she is still new to the game, she is willing to train other DJs in the future. For Moreno, it’s all about applying what you learn into the machinery. What do students think of St Francis College?